Adobe Photoshop is an incredible graphics application which has almost certainly had a larger bearing on the world of design than any other single piece of software. However there’s no doubt that Photoshop’s great strength – its titanic list of functions and abilities – can also be its weakness when it comes to streamlining your workflows. Thankfully, there are quite a few handy Photoshop plugins designed to reduce the number of steps needed to execute some tasks. So, in this article we are going to look at six of the best Photoshop plugins for saving you time by optimizing your graphics workflow. The first plugin we are going to look is at ‘Renamy‘, a powerful tool which gives you the ability to simplify actions you choose to perform on the Photoshop layers of your project. 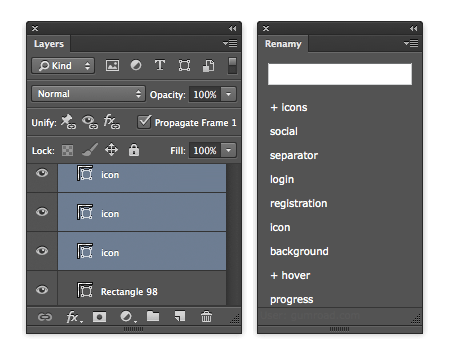 For example, you can select and rename multiple Photoshop layers just with one click. It may not be clear how useful this tool is if you only need to rename a handful of layers, but in large, complex projects, Renamy can be an absolute life saver. Furthermore, this clever little plugin even allows you to perform find-and-replace functions on particular words within your layer names. For instance, if you wanted to duplicate layers called ‘red layer’, ‘red template’, ‘red border’, and ‘red heading’, you can then rename them to their ‘green’ equivalent in one easy step. To speed up your workflow the Renamy developers have also introduced a nifty autocomplete function. Start typing a name and Renamy will provide a list of previously used names from which you can choose from. This can be particularly helpful when you need to enforce a predictable naming convention across your project amongst a design team, as it presents feasible names as you work. Perhaps you’re more interested in the relative order of layers than their titles. Renamy can help you out once again with a feature that associates a number starting from 0 to each layer in the file. Renamy is available both for Windows and for Mac, it costs $9.99 but it’s definitely worth it. There is also a free version, though some important functions are not present. 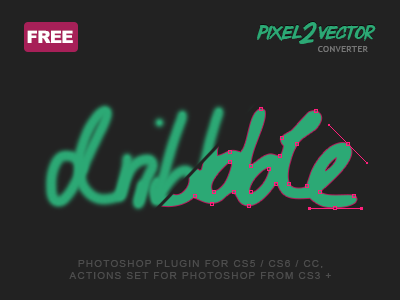 Pixel2Vector is a small but nonetheless impressive Photoshop plugin that will help you avoid needless work. Indeed thanks to Pixel2Vector, developed by The Orange Box, you can almost effortlessly convert any pixel graphics into a vector shape. This means that you can now draw anything you like using Photoshop’s brush or pencil tool, and then convert that image into a vector. What’s even more amazing is that you can do this with a single click. When the transformation is completed, you will get the image together with its path. In this way you can change the color of the picture or resize it without losing quality. Pixel2Vector is supported by Photoshop CS5,CS6 and CC. Moreover, the plugin is free of charge, so it’s a virtual no-brainer to grab a copy. 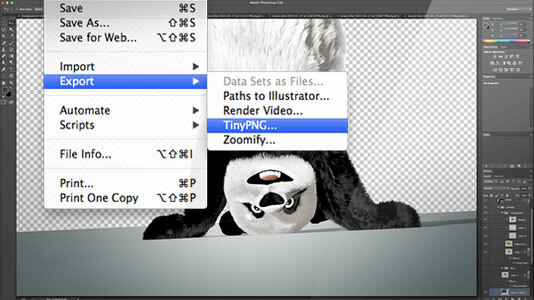 GuideGuide is a Photoshop plugin developed by Cameron McEfee. Since one of his favorite ideas is that “Guides are pain”, he had focussed on developing a faster way to create and manage guide lines . In fact, this tool provides a number of different time-saving tricks. The first one consists in creating a multi-column grid just with few clicks. You won’t need any more to do time-consuming calculations in order to decide where to place the guidelines or be concerned with having a precision eye. 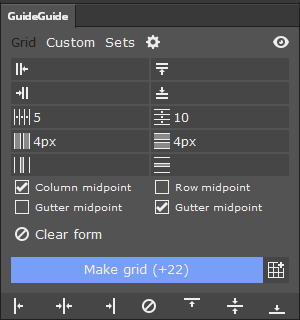 Using GuideGuide, you simply have to insert some parameters, such as the number of columns, their width, the pixels of the margins and a perfect grid will be instatly generated on your page. The second important point is that this extension can even create guides from the boundaries of a selection that you made earlier. You can also use GuideGuide to find the horizontal or vertical midpoint of your canvas. A very handy feature. This extension can be downloaded for free but, if you think that GuideGuide saved your time (or life), take a moment to make a small donation through the form at the bottom of the site. GuideGuide is supported by all the versions of Photoshop. TinyPNG is a plugin that reduces the size of your PNG files. Obviously PNG is a very useful web format because of it’s ability to render transparent images and because it is supported by many appplications and websites. Despite this, we find PNG files are routinely much, much larger than they need to be. TinyPNG was created to solve this problem: through the use of a gradual decrease in the number of colours rendered in an image, fewer bits are needed to store the pixel data. As such, you can mantain a very high quality photo and, at the same time, reducing the required file size by sometimes as much as 50%. After installing the plugin, you get access to a new panel which gives you the possibility to decide where to save the compressed file. TinyPNG costs $40 but, if you work with a lot of PNG files, it really can simplify your workflow while tangibly improving the quality of your work . Alternatively, you can use the free online version of TinyPNG but, as you will need to transfer the images from your design software to the browser to the online service and back, this will cost you some production time. Whether that loss of time can justified will be your call. 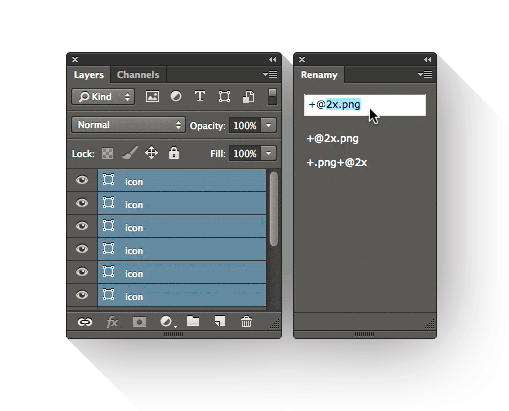 SavePanel is a Photoshop plugin designed to optimize the file saving process. Essentially SavePanel is a simple form which allows you to set your favorite parameters for saving files. In it allows you to customize your destination folder, the dimensions of the image, the file format and, of course, the file name. 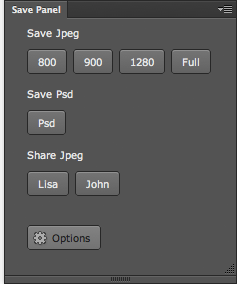 I think this plugin is particularly important for anyone who considers themselves Photoshop ‘power-users’. Take a typical situation where you might be working on many files simultaneously, and you need to save them all of these files to the same folder. SavePanel allows you to perform this task with only a few clicks — once you’ve you preset all the required saving information. If you’ve ever found yourself individually saving a seemingly endless string of files at the end of session, you’ll understand what a timesaver this is – and sanity preserver too. 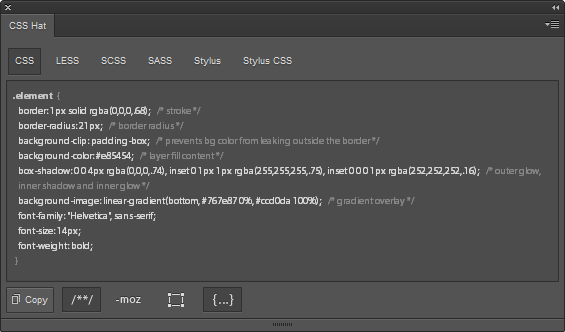 CSS Hat has become one of the most useful plugins for Photoshop in recent years. It converts Photoshop layer styles into pure CSS3 which can then be imported directly into your website project. This is a seriously neat trick. Obviously the power of CSS Hat lies in it’s ability to transforming a difficult task – the hand-coding of CSS properties derived from a design – to an automated process performed in literally a few seconds. Indeed once you’ve installed the CSS Hat plugin, all you need to do is select a Photoshop layer and copy it to the clipboard of CSS Hat. The code will be generated in an instant. This includes widths, heights, z-indexes, colors, and other CSS properties and built-in code checking. CSS Hat even supports LESS, SASS and Stylus too for you pre-processor fans. CSS Hat costs $34.99 but, if you are a web designer and heavy Photoshop user, you almost certainly benefit from it. It’s also worth noting that the license is not per device but per person, so you are free to install CSS Hat on more devices. So, there you have it! Five Photoshop plugins that help take the daily grind out your design work, while saving you time for stuff you’d rather be doing. Have you got any suggestions for any great plugins I’ve missed? I always love to get a peek at other designer’s workflows.